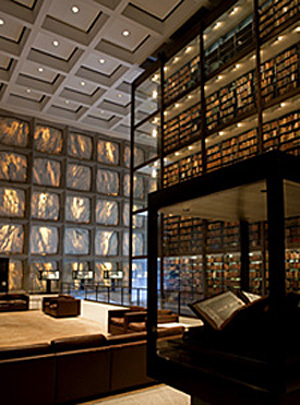 The Beinecke Rare Book & Manuscript Library marked its 50th anniversary in 2013. It was time to celebrate our success and our remarkable building – architect Gordon Bunshaft’s masterpiece of marble, granite, bronze and glass. But after 50 years as a world-class center of research and scholarship, the library’s infrastructure needs upgrading. We will undergo a major renovation from May 2015 to September 2016. The renovation will completely update the library’s mechanical systems and provide enhanced facilities for supporting its research and education mission. While work is under way, we will provide access to the library’s collections via a temporary reading room located in Sterling Memorial Library, across the street from the Beinecke Library. We will also have one classroom in Sterling Library available for Yale faculty to teach with the library’s collection material. Upgrade the library’s physical, mechanical, electrical, plumbing, fire protection, and security infrastructure, which will ensure that the building is capable of preserving the library’s collections through proper environmental conditions, fire suppression, and security. Replace the heating and air-conditioning system, which is central to maintaining the environmental conditions necessary for the long-term preservation of the collections. Complete interior and exterior restorations of the building, refurbishing its bronze and marble features; and restore the Noguchi Sculpture Garden. Double the number of classrooms and create private consulting space off the reading room for researchers, faculty, students, and staff. Enhance the technology available in the classrooms and teaching spaces. One classroom will be outfitted for use as a teaching lab. Create a new offsite headquarters for the library’s Technical Services Department, which is responsible for archiving the materials in the library’s collections. This will consolidate operations that currently occur in four locations. None of these enhancements will affect building’s architecture. We will work closely with HBRA Architects, Newman Associates, and Yale University Facilities to fully preserve Gordon Bunshaft’s vision. As you can imagine, relocating one of the world’s largest collections of rare books and manuscripts is a uniquely challenging task – one that we have already begun. We are committed to providing our patrons a high level of service throughout this project, and we are confident that the library will reopen in the fall of 2016 better equipped than ever to maintain its collections and share them with scholars, students, and the public.